Special Containment Procedures: All specimens of SCP-111 in captivity are housed at Site-19, ██████████ Wing, in a 5m x 5m x 5m plexiglass enclosure containing a temperate forest habitat transplanted from its natural surroundings. Habitat temperature will be maintained at 30° C. Feeding is to take place weekly by personnel placing three (3) kg of iceberg lettuce (Lactuca sativa) into the containment chamber. Water is to be supplied by an automatic misting system which regulates humidity levels at 50%, both for water required by SCP-111 and to prevent fires. In event of SCP-111 specimens breeding, personnel are to collect all eggs and transport them to the Biological Studies Wing for freezing. Description: SCP-111 is an apparently artificial species of invertebrate vaguely resembling snails. Adult specimens of SCP-111 are approximately twenty (20) centimeters in length, twelve (12) centimeters in width, and fifteen (15) centimeters in height, although exact size differs slightly between specimens. SCP-111 specimens differ from ordinary snails in that they have a warm-blooded metabolism, complex eyes, small "horns" consisting of cartilage-ridged tentacles, apparently increased intelligence (personnel are requested to read Test Log ██████ for examples), and a complex vertebrate-type jaw structure; as well, specimens lay eggs possessing hardened shells. Most abnormally, SCP-111 specimens possess small hollow sacs below their lower jaws containing methane from digestive by-products. A series of [DATA EXPUNGED] along the inside of the trachea serves as a "lighter" igniting stored methane as the specimen exhales, blowing a small jet of flame from its mouth. Said "fire-breathing" generally occurs in event of stress or anger, although is not apparently used deliberately for destruction but rather as a warning. This is presumably due to the limited size of methane sacs, which limits SCP-111 specimens in the amount of fire they can exhale at a time, and requiring both time and starch-rich food to refuel. SCP-111's behavior is inconsistent with that of ordinary snail species, including whistling and hooting vocalizations easily audible to humans, high intellect seen in such tests as [DATA EXPUNGED], and parents caring for their young. Hatchlings have been observed imprinting on their parents, other members of their own species, or researchers. This is presumed to be a deliberate trait based on Document 111-a, as it means that hatchlings imprint upon owners. History: On ██/██/████ a package containing twelve (12) SCP-111 eggs and Document 111-a was mailed to [DATA EXPUNGED], a Foundation front organization. Mobile Task Force Alpha-4 have proven unable to locate the sender of said package. New from Dr. Wondertainment, DRAGON-SNAILS™! The perfect pets for the fantasy-loving child. 1. Having read this document, take the eggs out of the box. Be careful, Dragon-Snail™ eggs are fragile! 2. Put the eggs in a warm, safe place, and wait 7 to 10 days. 3. Hold your newly-hatched Dragon-Snails™ so they get a good look at you and think you're their mommy. 4. 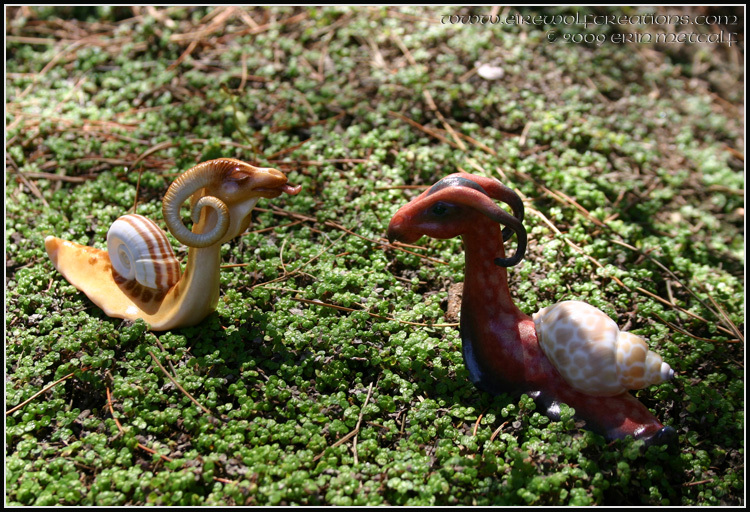 Enjoy your new pet Dragon-Snails™! To feed your Dragon-Snails™, give your new little friends some raw veggies: lettuce, brussels sprouts, beans, any sort of salad stuff you don't want! Remember to give them water - a small glass each, once a day. For your enjoyment, Dragon-Snails™ come in six types! Breed them for unique pets! 1. Slimybellies®: Adorable and oozy little fellows, with awesome fire-engine red colored skin, little black horns and belly, and a speckled tan shell! Beautiful robin's-egg-blue eggs! 2. Oozedrakes®: Inquisitive little creatures, with neat banana-colored skin, curly horns and striped shells! Pale tan eggs, like a chicken! 3. Goowyverns®: Dark blue-grey skin, flattened shells, and a bumpy-horned head make Goowyverns® look like tiny sea monsters! Eggs are a fantastic glassy-green color! 4. Blobworms®: Green-and-gold stripes, pointy shells, and a single horn, not to mention fuzzy tails, make Blobworms® wonderful pets! Eggs are tan, with a silver tint! 5. Glowdrakes®: New from Doctor Wondertainment, these little fellows may look like blue-black Slimybellies®… until they light up! That's right, Glowdrakes® glow in the dark! Eggs are a golden color with little red dots! 6. Gunkwyverns®: Chubby, green-skinned, and dome-shelled, Gunkwyverns® make great pets! Eggs are transparent, so you can see the baby Dragon-Snail® inside! Parental Notice: As Dr. Wondertainment's Dragon-Snails™ breathe fire, they have been known to cause house fires. For maximum playtime fun and safety, it is recommended that fire extinguishers be kept handy. Despite this, Dr. Wondertainment is not legally, morally, or financially responsible for any injuries, death, or property damage resulting from the unsafe use of Dragon-Snails™ or any other Dr. Wondertainment products.